Besides play of the full narrative, the game offers a number of historical dissections, each a scenario focusing on a fragment of the raid. They are also a handy way to learn the game, since each scenario uses only part of the rules. 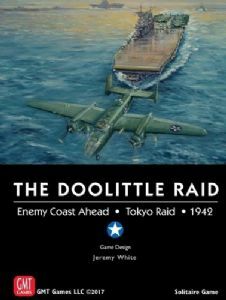 For example, Scenario One covers Doolittle’s flight over Tokyo, using only the 8.5x11 Target Map and the Attack Segment. An alternative scenario looks at a night raid by that flight, as Doolittle originally planned it. After playing one or two small scenarios using only the Attack segment’s rules, a larger scenario can be played adding the Flight segment. Graduate next to an even larger scenario that starts with the Naval segment. In this way a player can learn the game in program fashion, little by little, studying the history of the raid by playing it as he learns. Player Aid Folders: The game comes with several 11” x 17” bi-fold aids allowing the play of each game segment with minimal study of the rule book. The mapsheet is designed to interlock with other game components, including those play aids, in order to make the player’s experience fluid.